What is the difference between Advantage Multi and Revolution? Advantage Multi (also known as Advocate in Australia) - is a new multi-purpose medication that combines Imidacloprid (the active ingredient in Advantage) with Moxidectin. It treats fleas, as well as prevents heartworm, hookworm and roundworm in dogs and cats, plus whipworm in dogs. It also controls other external parasites such as lice and ear mites in cats, and mange and lice in dogs. Application is monthly to the skin at the back of the neck. Advocate (Advantage Multi) does not treat ticks or tapeworm. It is recommended to worm with a tapewormer such as the Virbac tapewormer tablets once every 3 months. Revolution – also has a multiple action. It is easy to use, controls the American dog tick as well as fleas. 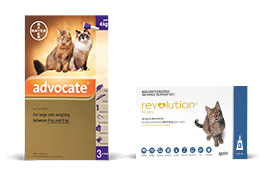 The main advantage of Revolution is that it also treats heartworm as well as ear mites and intestinal worms in cats. It is a very good treatment for cats that do not like taking tablets. 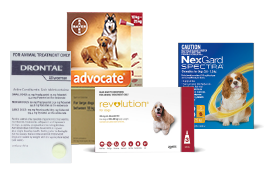 Like Advocate, Revolution is eliminates the need to use separate flea and heartworm preparations each month. In dogs it is recommended that you still give an all wormer once every 3 months which treats all of the gastro-intestinal worms, such as the economical Popantel tablets. What is the difference between Advantage and K9 Advantix? 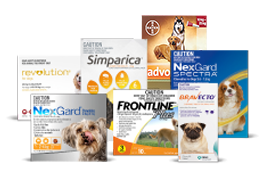 Advantage and K9 Advantix are made by the same manufacturer – Bayer. They both contain an ingredient called imidacloprid, which kills adult fleas, as well as flea larvae on cats and dogs for up to a month after application. It also has a claim to kill lice for up to 6 weeks in dogs. As both products contain the same ingredient for flea control they have a similar activity against fleas. Advantage and K9 Advantix both kill 98-100% of fleas on a dog within 12 hours. The difference between K9 Advantix and Advantage is that Advantix also contains permethrin, an ingredient which repels and kills ticks, mosquitoes and sand flies for up to a month. K9 Advantix is registered for the treatment and control of deer ticks (the major carrier of Lyme disease), American dog ticks, Brown dog ticks and lone star ticks. 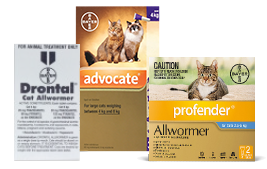 Permethrin is highly toxic to cats, so Advantix is only for use in dogs. If you have dogs and live in an area where ticks are a problem, Advantix would be the better product to use. In households where dogs and cats socialize closely it is recommended that you don’t use Advantix due to the serious harmful effects that this product has on cats and Advantage is preferred. What is the difference between Frontline Plus and Frontline Top Spot? Frontline Top Spot and Frontline Plus are made by the same manufacturer – Merial. They both contain an ingredient called fipronil, so they offer the same killing activity against adult fleas and ticks. However, Frontline Plus also contains an ingredient called S-methoprene. S-methoprene belongs to a class of compounds known as Insect Growth Regulators or IGRs which kills flea eggs and larvae. Frontline Plus controls all stages of the flea life cycle and aids in environmental control of fleas. Owners generally report better long term flea control when using Frontline Plus when compared to Frontline Top Spot however Frontline Top Spot costs less and so is more economical. What is the difference between Revolution and Frontline Plus? Revolution is a topical 'spot-on' parasiticide used in the treatment and prevention of fleas, heartworm and ear mites in dogs and cats. Frontline Plus is also a topical 'spot-on' type application and is used for the treatment and prevention of fleas, ticks and lice on dogs and cats, however the main difference is that Frontline Plus has no effect against heartworm. Heartworm is a serious disease spread by infected mosquitoes. Heartworm infection is widely distributed throughout the United States and has been found in dogs native to all 50 states. Treatment is very involved, complex and expensive, therefore prevention is preferable to the cure. When using Frontline Plus pet owners are also advised to use a heartworm preventative. 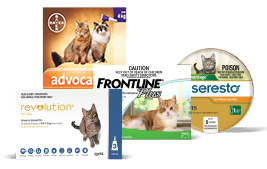 Both Revolution and Frontline Plus have a rapid onset of action for fleas. Both Revolution and Frontline Plus kill the egg stage as well as the adult stage of the flea lifecycle. Revolution is registered for the control of the American dog tick - Dermacentor variabilis while Frontline Plus is registered for the control of the brown dog tick, the American dog tick, the lone star tick and deer ticks. Revolution contains the active ingredient selamectin while Frontline Plus contains fipronil and S-methoprene. What is the difference between Heartgard Plus and generic Heartgard (Nuheart)? When a pharmaceutical company first develops a medicine, they have a patent which allows them exclusive rights to manufacture and market the drug. After the patent for the original medicine expires, other manufacturers can manufacture the medicine with the same active ingredient. These are called generic medicines. Generic medications cost a lot less than the brand name medication because generic manufacturers don't have to invest large sums of money to discover the drug. Well made generic medications from a reputable manufacturer are every bit as good as the brand counterpart. The generic Heartgard that we have on our site is called Nuheart. It is manufactured by one of Australia’s larger animal health product manufacturers, Pharmachem. Pharmachem is licensed by and regulated by the Australian equivalents of the FDA and EPA –- the National Registration Authority and the Australian Pesticides and Veterinary Medicines Authority - to ensure that the generic medications they produce have the same active ingredients as the brand name and works the same way in the body in the same amount of time. 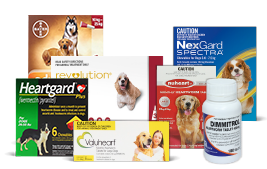 Nuheart tablets (Ivermectin) are given once a month year round for the prevention of heartworm disease in dogs. Nuheart has exactly the same active ingredient Ivermectin as is found in Heartgard and Heartgard Plus and each tablet contains exactly the same amount of ingredient. The tablets are small, round, meat flavored and are readily accepted by dogs. For difficult dogs Nuheart tablets can be dissolved in a small amount of water and mixed in the pet's food. The weight range of the different pack sizes are exactly the same as the Heartgard. For dogs up to 25 lb the dosage is 68mcg of Ivermectin – 1 tablet from blue pack, for dogs 26-50 lb the dose is 136mcg – 1 tablet from green pack and for dogs 51-100 lb the dose is 272mcg – 1 tablet from the red pack each month. Dogs over 100 lb are given a combination of the tablets. Nuheart tablets are the same as Heartgard tablets. Heartgard Plus also contains another active ingredient called Pyrantel for the control of roundworms and hookworms. It does not cover tapeworm or whipworm, so regular worming with an allwormer such as Drontal or Popantel is recommended to treat the gastro-intestinal worms for all dogs on monthly Nuheart, Heartgard tablets and Heartgard Plus chewables.